In 1910, Chicago physician James B. Herrick made medical history when he published a scientific paper describing the case of an anemic patient who suffered from a blood disorder characterized by oddly elongated, sickle-shaped red-blood cells. The disorder was later termed sickle cell anemia, after the unusual shape of the blood cells. Herrick’s paper was the first documented description of the disease in Western medical literature. A hereditary blood disorder, sickle cell disease is most common in people whose families originate in Africa, South or Central America, Caribbean islands, Mediterranean countries, India and Saudi Arabia. In the United States, sickle cell anemia, a type of sickle cell disease, affects some 70,000 to 100,000 people, mainly African Americans. Those who have the disease suffer lifelong anemia and periodic crises of severe pain. 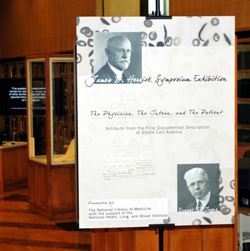 An exhibition highlighting Herrick’s pioneering work will be on display February 8-11, 2011 in the History of Medicine Division Reading Room at the National Library of Medicine. The exhibition was first shown in November 2010 during a two-day symposium marking the 100th anniversary of the publication of Herrick’s groundbreaking paper. The National Library of Medicine (NLM) and seven other institutes and centers of the National Institutes of Health convened the James B. Herrick Symposium – Sickle Cell Disease Care and Research: Past, Present, and Future. As part of the event, the NLM, with support from the National Heart Lung, and Blood Institute (NHLBI), developed a concurrent, commemorative display. “The symposium was a special opportunity to showcase some of the original historic documents on which Dr. Herrick’s article was based,” said HMD Rare Book Librarian Dever Powell, who curated the display. Powell and Dr. Jeffrey S. Reznick, HMD’s Deputy Chief, represented the NLM on the scientific planning committee that organized the Herrick Symposium and the accompanying display. For the display, Powell visited the Special Collections Research Center at the University of Chicago Library, which holds the James. B. Herrick Papers, and secured the loan of documents relating to the 1910 article, including blood examination reports. 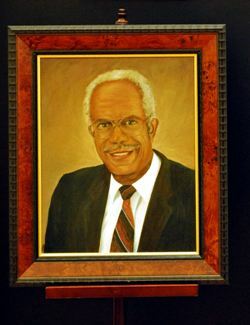 He also visited the Rush University Medical Center Archives, which provided period photographs of Herrick, and his intern, Dr. Ernest E. Irons, who did much of the work with the patient, Walter Clement Noel; Howard University’s Moorland-Spingarn Collection; the Sickle Cell Disease Association of America headquarters in Baltimore; and the United States Postal Service, which lent to the NLM for the display the original artwork of the 2004 Sickle Cell Disease Awareness Stamp by well-known artist and illustrator James Gurney. “I wanted original materials on display for this special occasion.” Powell said. He also located and contacted the grandchildren of Dr. Herrick and Dr. Irons. It was Dr. Herrick’s granddaughter, Elizabeth Gilbert, who put Powell in touch with the University of Michigan for the loan of Herrick’s 1882 undergraduate photo album. The scientific planning committee invited the grandchildren to the Symposium as special guests. Dr. Herrick’s grandson, James Gilbert, attended, as did Nancy Irons, Dr. Irons’ granddaughter. For the February reinstallation of the display, Mr. Gilbert lent to the NLM three photographs of Dr. Herrick in the 1880s. The November 16th opening reception was funded by the Foundation for the National Institutes of Health (FNIH). The event drew more than 150 visitors. During the reception, NLM staff members were also on hand to describe and demonstrate various NLM programs, including Profiles in Science, conservation, historical images and archives, and rare books. Both James Gilbert and Nancy Irons were among the visitors to the HMD reading room. They were especially moved to see their grandfathers’ original manuscripts. More than 30 of the world’s top experts in sickle cell disease presented at the landmark symposium, which, to accommodate the large crowds, was held in auditoriums on the NIH campus. Joining these experts in examining the disease’s history, impact and outlook was an audience of researchers, health care providers, advocacy groups, patients, academics, and members of the public. Sir David Weatherall, winner of the 2010 Lasker-Koshland Special Achievement Award in Medical Research, gave the keynote address at the symposium dinner. He is a pioneer in genetic diseases of the blood, especially thalasemmia, which affects millions of children worldwide.